This scene opens to find Dory looking sad and lonely. She starts to cry, it’s not a pretty sight nor a pretty sound. In the distance, a stingray can be seen gliding through the water. He hears her crying and begins to swim her way. As he approaches, we recognize him as Mr. Ray. He asks Dory, "What seems to be the trouble, little lady?" 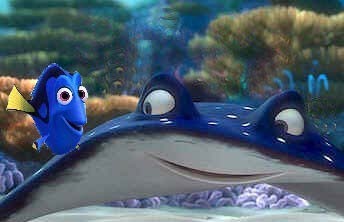 Dory, barely noticing Mr. Ray, sniffs and then mumbles, "I don’t know." Mr. Ray replies kindly, "You don’t know? What do you mean, you don’t know?" Dory, finally looking at him, says, "I don’t know anything. Who I am or what I am!" She begins crying anew. Mr. Ray smiles a little and says, "Well, little lady, that sure is a problem. But I’ll let you in on a little secret, you are who you are. We’re all looking for ourselves. We may lose ourselves every now and then, but eventually, we find our way back. You will, too." Mr. Ray teaches Dory that it's ok to "Just Be Yourself" in the musical number of the same name. Dory perks up a little. Yes, she decides, I am who I am! I can just be me! She begins twirling around and singing, "I am me! I am me!" Mr. Ray continues to tell Dory that she’s a type of fish called a blue tang and often seen around the reefs of East Africa, Japan and the Great Barrier Reef. Blue tangs can live singly but sometimes choose to forage with another fish. At this, Dory stops her musical solo to say, "Another fish? You mean, like a friend? What a great idea! 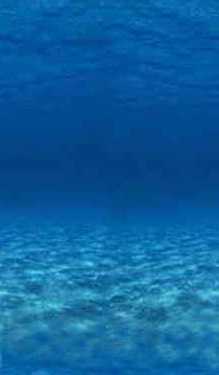 I'm going to swim the ocean until I find a Special Friend! Just keep swimming, just keep swimming..."